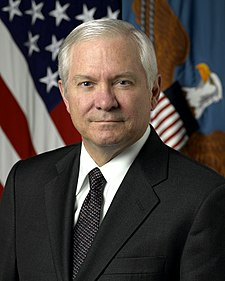 Robert Michael Gates (born September 25, 1943) is currently serving as the 22nd United States Secretary of Defense. He took office on December 18, 2006. Prior to this, Gates served for 26 years in the Central Intelligence Agency and the National Security Council, and under President George H. W. Bush as Director of Central Intelligence. Before he joined the CIA, he served with the United States Air Force (USAF). After leaving the CIA, Gates became president of Texas A&M University and was a member of several corporate boards. Gates also served as a member of the Iraq Study Group, the bipartisan commission co-chaired by James A. Baker III and Lee Hamilton, that has studied the Iraq War. He was also the first pick to serve as Secretary of the Department of Homeland Security when it was created following the September 11, 2001 attacks, but he declined the appointment in order to remain President of Texas A&M University. Starbucks Corporation Founded in 1971 and headquartered in Seattle, WA, Starbucks Corporation (NASDAQ: SBUX) is the world's largest specialty coffee retailer. The company has over 10,000 locations worldwide.